Support the Association of Old Crows' Scholarship Program while you complete your Christmas shopping! 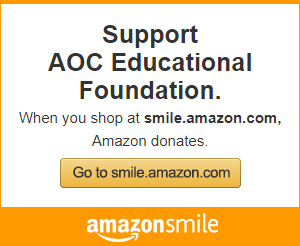 Go to www.smile.amazon.com/ch/54-1337848 and with every purchase, Amazon donates to the AOC Educational Foundation! CATCH UP ON All the News from the 54th Annual AOC International Symposium & Convention! The 54th Annual AOC International Symposium & Convention has come and gone and the AOC couldn't be prouder. This year's convention and symposium had almost a 30% increase in attendees and a 10% increase in exhibitors resulting in dynamic sessions, an exceptional show floor and camaraderie among Crows. AOC looks forward to collectively making our community stronger and aims to grow and serve as your premier marketplace for business and professional development. Stay tuned for more information on the 55th Annual AOC International Symposium & Convention soon! Space is an Electronic Warfare domain, just like land, sea and air. We significantly dependent on satellite assets and those assets are vulnerable to enemy kinetic or electronic attack. In ground, sea and air based EW, the closer we get to targets, the better we can intercept or jam them. Satellite borne systems are by their nature far away—creating challenges that require careful consideration. In this Webinar, we will discuss the nature of EW in space. First we will talk about the nature of Earth satellite orbits and their parameters. Satellites do not go where we want them to go in the short term; they go where they want to go. However, we can predict where they will be at any given time. Finally, we will briefly discuss two practical problems: Intercept and jamming of a threat on the Surface of the Earth from a satellite. INDUSTRY NEWS: Israel's F-35I Adir Is Ready for Combat, But When Will It Be Headed Into Harm's Way? INDUSTRY NEWS: The Marine Corps Wants to Craft a Fleet of 1,000 "Itty Bitty Boats"